My family (immediate, aunt, uncle, cousins, etc.) and friends all went on this cruise recently and it wasn&apos;t like a normal Carnival cruise. Usually on Carnival, there are so many things to do and so much entertainment that you have a hard time deciding what to do. On this cruise, there was limited entertainment - only a few shows and comedy seemed to be the highlight of every night. The comedy shows were good, but were also repeats a lot of the time and since this was the only thing going on most nights, there wasn&apos;t another option so we actually saw a few repeat shows. There was also a lot missing in terms of the normal pool activities and day at sea events. This seemed very strange to my family and I because Carnival ships are known as the "fun ships". We told our friends who were first-time cruisers to set the bar low with this experience because it was not like a normal cruise. Also, Carnival has changed their returning cruiser program and no longer has the same benefits. I was very disappointed to find that instead of being invited to the cocktail party, my brother and I both only received a free drink coupon. 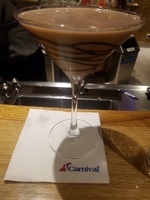 This was disappointing because this was our 6th cruise with Carnival and we usually get to go to the cocktail party, so to go backwards from this within a rewards program seems very strange. The ship was very nice, loved Guys burger bar, the rum bar, and all the different themed restaurants and lounges. Really liked the different hot tub areas and the slides were really fun as well. 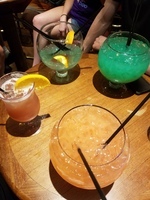 Loved that the bar had a happy hour with $10 fish bowls and had a lot of fun playing bags on one of the lower outside decks. Comedy lounge had the best bartender that makes exceptional chocolate martinis! 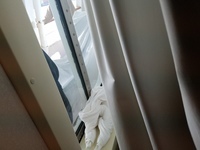 The worst part of this cruise however, was the fact that they decided to do construction/cleaning on our balcony. One of the nights, we came back to a letter saying they would be doing PAINTING on our balcony the next day. Next day came and went, didn’t really notice anything so we thought, “oh nice, they must have been quick, no real inconvenience”. Nope, wrong. The following day, with no letter notifying us of anything more to be done, we were woken up to someone jackhammering outside our window. Like in the window frame. Apparently, they were stripping the paint/rust and repainting. This took a good amount of the day and was so loud we had to leave our room. Carnival may have notified us of "painting" one of the days, but this was more than painting and their notice was for the wrong day. This kind of construction should have been done during dry docking or at least in between cruises, when no one is paying extra money for a balcony room for their vacation. Highly annoying and disappointing. My family (immediate, aunt, uncle, cousins, etc.) and friends all went on this cruise recently and it wasn&apos;t like a normal Carnival cruise. Usually on Carnival, there are so many things to do and so much entertainment that you have a hard time deciding what to do. On this cruise, there was limited entertainment - only a few shows and comedy seemed to be the highlight of every night. The comedy shows were good, but were also repeats a lot of the time and since this was the only thing going on most nights, there wasn&apos;t another option so we actually saw a few repeat shows. 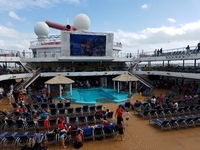 There was also a lot missing in terms of the normal pool activities and day at sea events. This seemed very strange to my family and I because Carnival ships are known as the "fun ships". We told our friends who were first-time cruisers to set the bar low with this experience because it was not like a normal cruise. Also, Carnival has changed their returning cruiser program and no longer has the same benefits. I was very disappointed to find that instead of being invited to the cocktail party, my brother and I both only received a free drink coupon. This was disappointing because this was our 6th cruise with Carnival and we usually get to go to the cocktail party, so to go backwards from this within a rewards program seems very strange. The ship was very nice, loved Guys burger bar, the rum bar, and all the different themed restaurants and lounges. Really liked the different hot tub areas and the slides were really fun as well. Loved that the bar had a happy hour with $10 fish bowls and had a lot of fun playing bags on one of the lower outside decks. Comedy lounge had the best bartender that makes exceptional chocolate martinis! The worst part of this cruise however, was the fact that they decided to do construction/cleaning on our balcony. One of the nights, we came back to a letter saying they would be doing PAINTING on our balcony the next day. Next day came and went, didn’t really notice anything so we thought, “oh nice, they must have been quick, no real inconvenience”. Nope, wrong. The following day, with no letter notifying us of anything more to be done, we were woken up to someone jackhammering outside our window. Like in the window frame. Apparently, they were stripping the paint/rust and repainting. This took a good amount of the day and was so loud we had to leave our room. Carnival may have notified us of "painting" one of the days, but this was more than painting and their notice was for the wrong day. This kind of construction should have been done during dry docking or at least in between cruises, when no one is paying extra money for a balcony room for their vacation. Highly annoying and disappointing. This was fun, but more like a lazy river than a rapids tubing adventure. Weren&apos;t expecting a total wild ride, but at least some rapids to where it could be called an "adventure". Guide had to actively paddle us at some points. Still fun and nice lunch included. Expensive drinks though.